A better lifestyle, riding on the promise of wealth creation through new job opportunities, has led to the expansion of cities’ borders to create megacities (defined as a population of over 10 million people) around the world, according to GlobalData a leading data and analytics company. The company’s City Economics Database reveals that close to 8.2 % of the world’s population live in megacities which contribute 14% to total Global GDP. 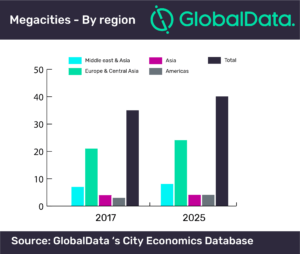 Of the world’s 35 megacities in 2017, 21 were located in the Asia and GlobalData estimates that close to 60% of megacities will be located in the continent by 2025 (including 11 in China and 6 in India). The next 5 cities that are projected to become megacities between 2017 and 2025 are Cairo (Egypt), Bogotá (Colombia), Hyderabad (India), Lahore (Pakistan) and Zhengzhou (China). Interestingly, three of these are also from Asia. Megacities provide numerous opportunities for businesses, investments and trade whilst offering their populations a good standard of living. However there are drawbacks which disrupt the socio economic balance including crime and corruption, income inequality and being a source of deteriorating environmental and health conditions. Ramnivas Mundada, Economic Research Analyst at GlobalData said, “The right planning and investments in education, infrastructure, technology and transport, along with the adoption of robust social policies can help in achieving sustainable growth”. As part of GlobalData macroeconomic data and insight analysis offerings for cities, the company provides a comprehensive data on over 3,000 cities, including major metropolitan areas in 150 countries. The database covers over 300 indicators for each city across five essential indicator themes namely demographic, economic, employment, income, and expenditure data. Long-term historical data is sourced from a number of national statistical and international institutions, with forecasts provided by GlobalData’s team of highly experienced economists.